Try this nutrient packed smoothie recipe! Looking for a breakfast smoothie that will keep you going all morning? Do you need a mid-afternoon snack to fuel your mind and sustain you ‘til dinner? Below you will find a recipe for a smoothie that will brighten your day and provide you with beneficial nutrients to help perk you up and get you dreaming of summer berry picking! The primary ingredient in this smoothie is frozen wild blueberries. If you can’t find wild blueberries look for organic. I highly recommend blueberries to my clients because they are a low sugar fruit packet with fiber and important nutrients. See the table below that highlights the star nutrients found in one cup of raw or frozen blueberries. Nutrient data for this list from USDA SR-21. From the table above you can see that blueberries are low in calories, sugar, and total fat while providing a good source of fiber, omega 3 and omega 6 fatty acids and vitamin C, vitamin K and manganese. There is more to the picture. Have you heard of phytonutrients? Wow! That is an impressive list! Of the phytonutrients mentioned above, one in particular, anthocyanin, deserves special mention. Anthocyanins are abundant in blue and purple fruits and vegetables. They are found mostly in the skin of fruits such as blueberries and are powerful antioxidants. 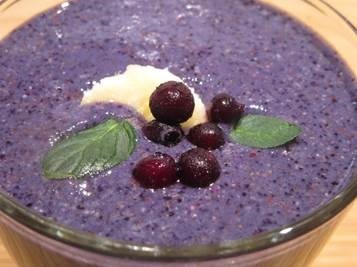 A scientific study just published in Food Chemistry found that blueberries are especially high in anthocyanin.6 Another study suggests that while anthocyanin levels are high in all purple or blue berries they are slightly higher in wild blueberries.7 This is why I encourage you to first look for frozen wild blueberries for the smoothie recipe below. NOTE: You can follow my version exactly that is pictured at the top of this article or make suggested modifications as you prefer. My version ingredients are bolded, options are in plain text. In order listed add all ingredients, except for the collagen powder, to a blender or smoothie blender cup such as a Nutribullet. Blend until smooth. Add additional liquid, if needed, for desired consistency. Add collagen powder and blend for just a few seconds until mixed in. Garnish with a few frozen blueberries, a banana slice and a couple of mint leaves. Make sipping this smoothie a mindful meditation. Pause to consider the land where the berries grew and who harvested and processed them while noticing the color, flavor, temperature and texture of the blended ingredients. If you actually “chew” your smoothie you will mix it with important digestive enzymes in your mouth and help your body break down and use the nutrients more fully. You will also feel more satisfied. Cutler BR, Petersen C, Babu PVA. Mechanistic insights into the vascular effects of blueberries: Evidence from recent studies. Molecular Nutrition & Food Research. 2016. doi:10.1002/mnfr.201600271. Hossain M, Shea E, Daneshtalab M, Weber J. Chemical Analysis of Extracts from Newfoundland Berries and Potential Neuroprotective Effects. Antioxidants. 2016;5(4):36. doi:10.3390/antiox5040036. Wang H, Guo X, Hu X, Li T, Fu X, Liu RH. 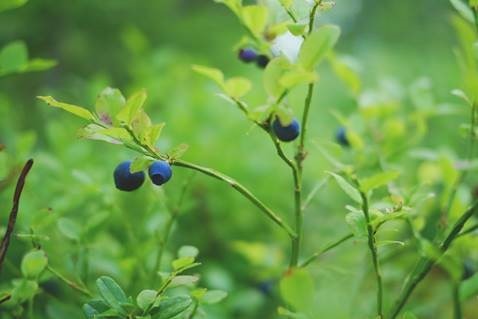 Comparison of phytochemical profiles, antioxidant and cellular antioxidant activities of different varieties of blueberry (Vaccinium spp.). Food Chemistry. 2017;217:773-781. doi:10.1016/j.foodchem.2016.09.002. Kuršvietienė L, Stanevičienė I, Mongirdienė A, Bernatonienė J. Multiplicity of effects and health benefits of resveratrol. Medicina. 2016;52(3):148-155. doi:10.1016/j.medici.2016.03.003. Mehta AJ, Cassidy A, Litonjua AA, Sparrow D, Vokonas P, Schwartz J. Dietary anthocyanin intake and age-related decline in lung function: longitudinal findings from the VA Normative Aging Study. American Journal of Clinical Nutrition. 2016;103(2):542-550. doi:10.3945/ajcn.115.121467. Hosseinian FS, Beta T. Saskatoon and Wild Blueberries Have Higher Anthocyanin Contents than Other Manitoba Berries. Journal of Agricultural and Food Chemistry. 2007;55(26):10832-10838. doi:10.1021/jf072529m.